The Marvel -20 Lab Freezer work well for laboratories working with minimal space. 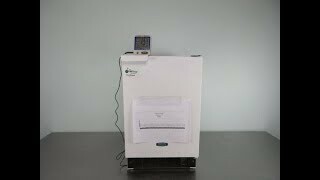 The easy to use, slim design -20°C freezer conveniently fit under most lab benches, tucked away in the corner of your lab or on a bench nearby. The 1.22 cu ft interior of this mini lab freezer is free of shelving to maximize the space with an access port for a temperature probe. This Marvel -20 Freezer takes up a minimal amount of space on a bench at a scant 15” across and 2.4 sq foot footprint. This Marvel -20°C Lab Freezer has been tested and is ready for shipment with a three business day turnaround time. All of our lab equipment comes backed with our standard warranty. Should you have any questions please don't hesitate to contact us.